by Nomstress in Baked, Boiled Tags: Baked but not Quick, Cheek-in, CHEESY, Easy Noms, just FUN, Spicy! I try to avoid going to the market on weekends. Yes, it’s crowded, and slower than weekdays, but what really gets me is the food tasting. I taste things I wouldn’t normally make, and it’s good. Then I get a ginormous jar of whatever product it was I just tasted, go home, and make meal X for the family. Invariably it receives mixed reviews at home. Sigh. This one was a winner, however. I did tweak the recipe on the jar a bit. Who can possibly argue with more cheese? Unless maybe you’re lactose intolerant. But then you can use soy cheese or any of the other non-cheese cheeses that are commonly available these days! You’ll need to boil a chicken. I used a whole chicken, because skinless breasts just don’t have that much flavour, and they’re rather expensive in comparison. AND…you get more chicken, so you can make more than one dish from the same chicken. When the chicken is fully cooked, set it in a bowl to drain. 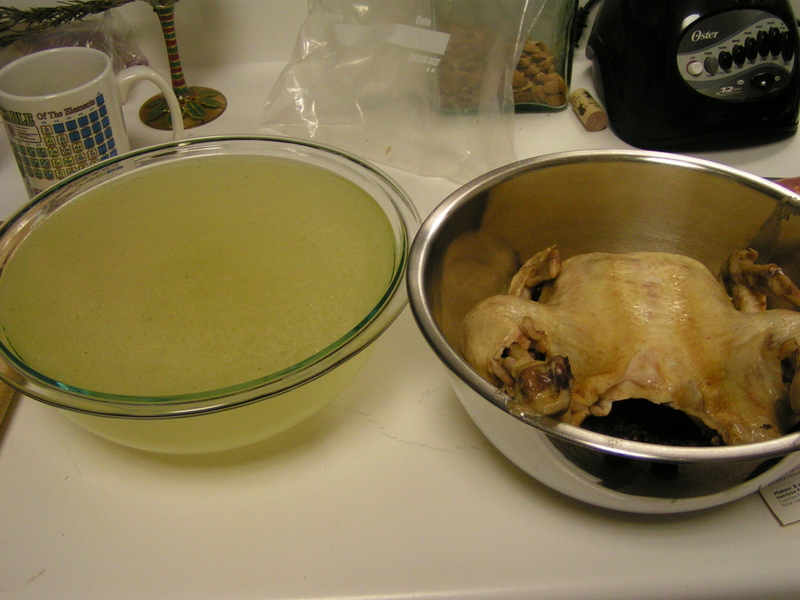 Strain the liquid in the pan, reduce it, and you have some delicious non-salty chicken broth. Save this, and we’ll make some delicious chicken vegetable soup! 1) Do make sure to remove the giblets before boiling! 2) De-bone carefully. You don’t want anyone to choke or lose a tooth later! 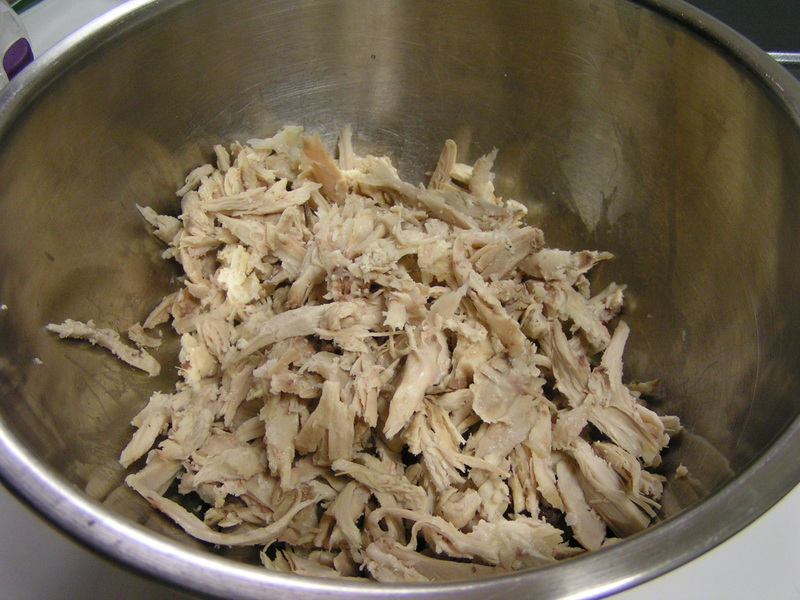 Shred 2 to 3 cups of chicken. Add 2-3 cups shredded cheese. I used a cheddar Habanero variety, but it really wasn’t very spicy. 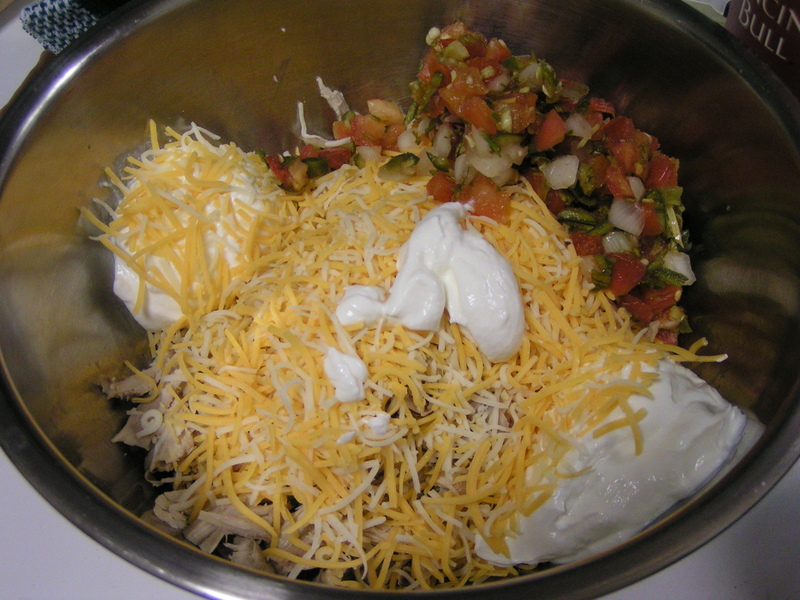 Also add 1 cup sour cream, and 1 cup pico de gallo. 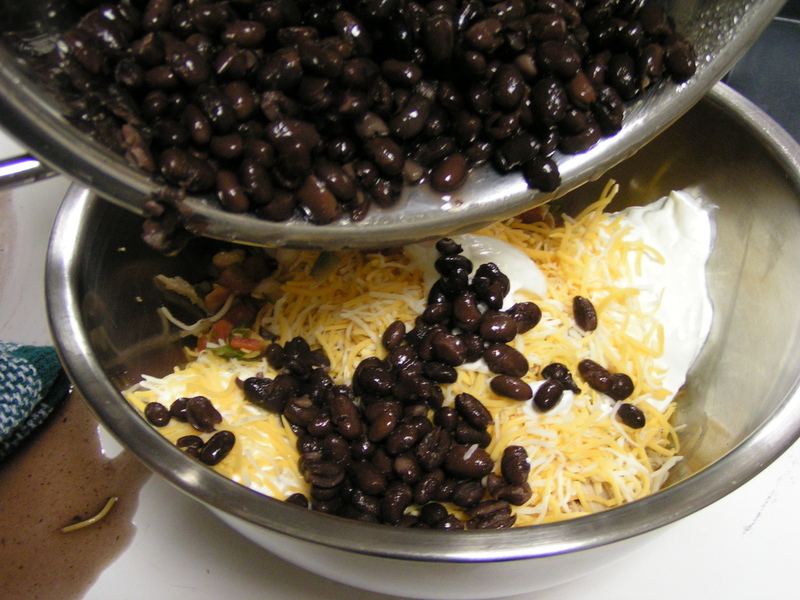 Stir together, and then add 1 can of black beans, drained and rinsed. 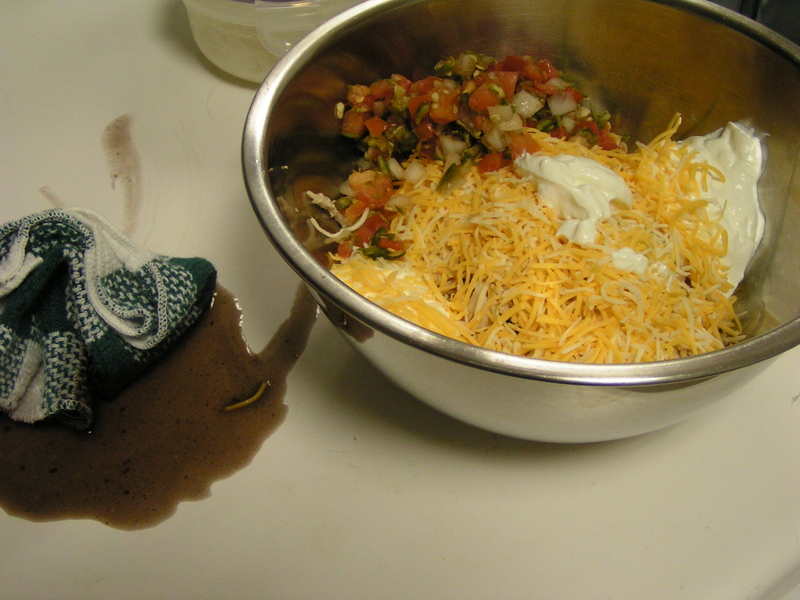 Try not to be like me and pour the black bean juice all over the counter. Some days I just can’t hold onto things. This morning, I poured half my cup of coffee on the counter in the same spot. There is a land shark living there. That MUST be it. 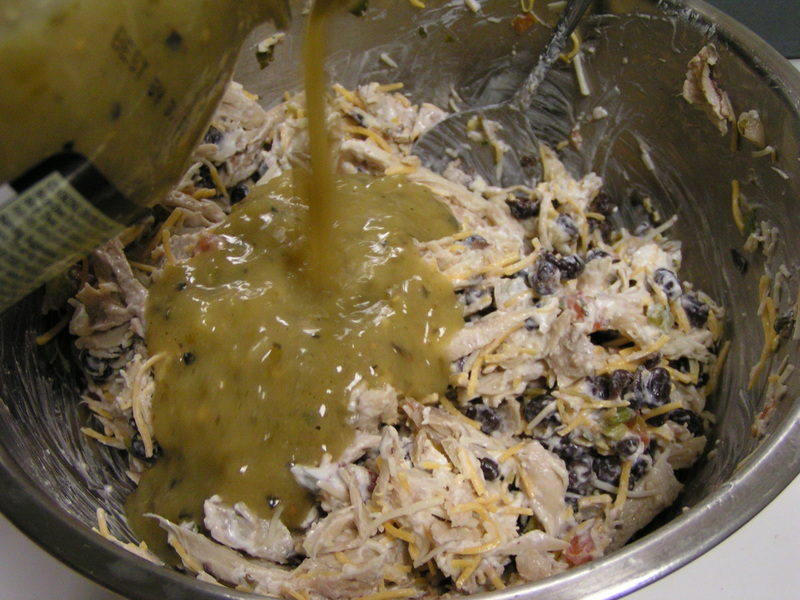 After the filling is combined…gently as to not squish the beans, pour in about half the jar of Cookwell & Company Green Chile Stew, until the filling is quite moist. 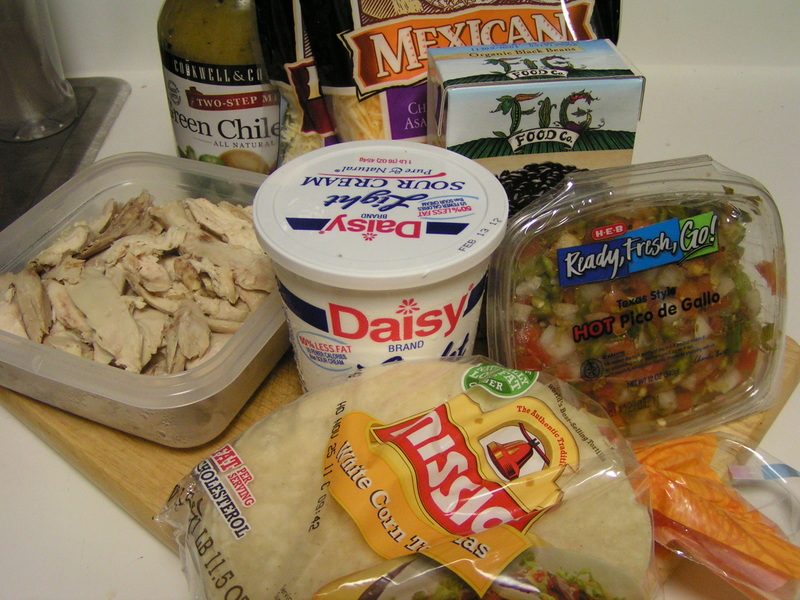 Microwave the corn tortillas until they are pliable, then spoon about 3 teaspoons of the filling into the tortilla, roll, and place into your baking dish of choice, seam side down. The recipe says to use a 9 x 13. I chose to use non-stick so I wouldn’t have to grease it. 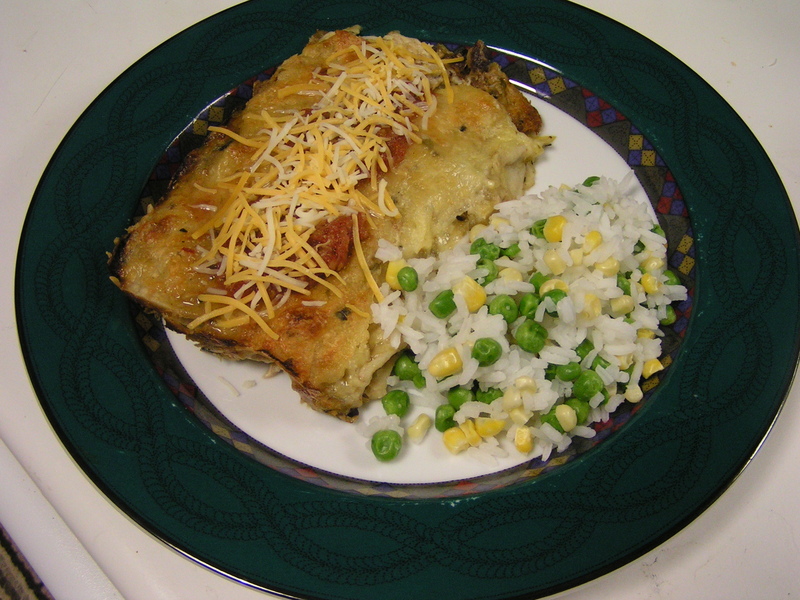 I made enough filling with this recipe to make 2 pans! 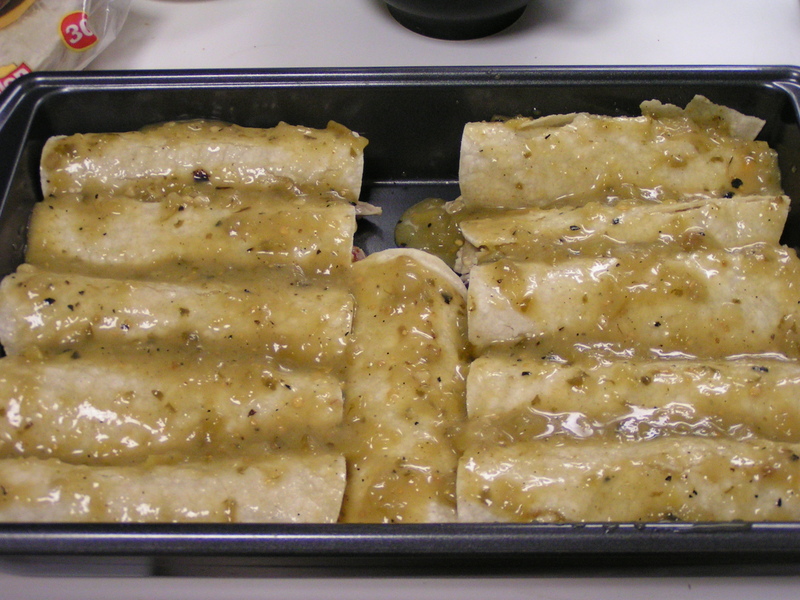 That was about 24 enchiladas! 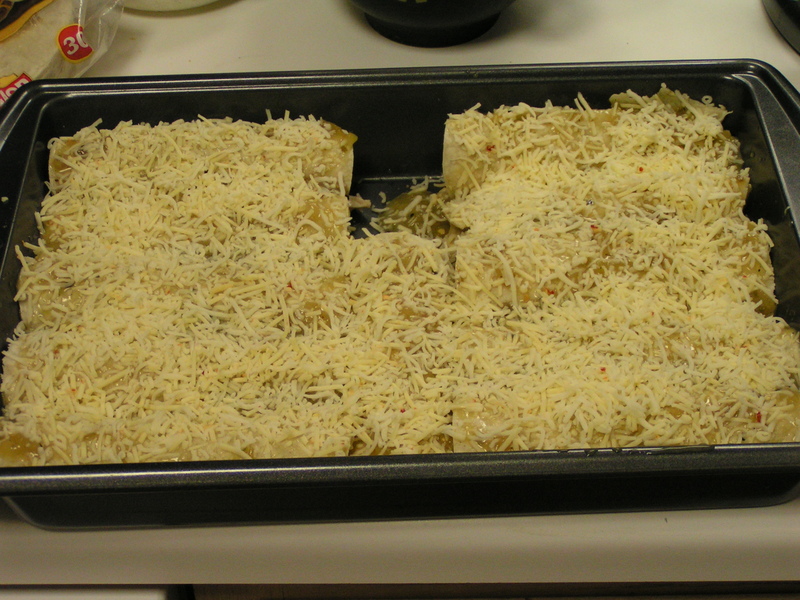 Cover then with some of the remaining Chile Stew mixture, then liberally apply shredded cheese. Bake at 350F for 30 – 40 minutes. Hope everyone is having a good week before Christmas! Previous Caturday in the Kitchen Next Thanks Again Microsoft. This sounds good. Hubby would love it, I’m sure.